Since January 2017, Simtars (RTO 1828) has held 42 courses and issued over 300 statements of attainment in the Respirable Dust Sampling training course. On November 14, 2018, Simtars issued its 300th statement of attainment for the Downer Group operating at the Meandu Mine - a fantastic achievement, and a testament to the worldclass expertise that the Simtars RTO has at its disposal. Eight Downer Group employees from the Meandu Mine undertook training combined with written and practical assessments to achieve the required competency. 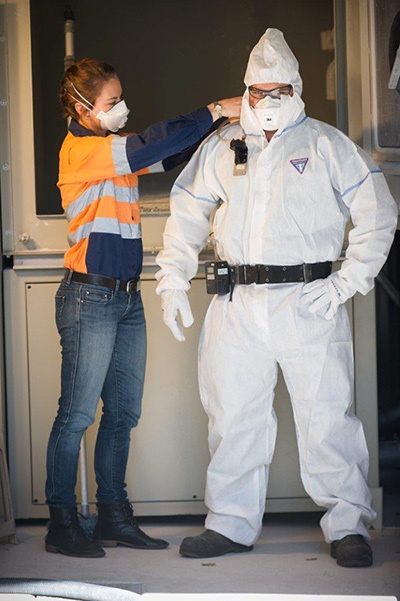 This was an outstanding effort from those involved and further enhances the Downer Group’s capabilities to collect, interpret, evaluate and respond to on-site respirable dust issues. Successful learners in this course obtain a statement of attainment issued by Simtars RTO 1828 for BSBWHS409 - Assist with workplace monitoring processes. This nationally accredited unit of competency is recognised by both the Coal Mining Safety and Health Advisory Committee (PDF, 314.0KB) and the Mining Safety and Health Advisory Committee (PDF, 230.6KB) for persons carrying out respirable dust sampling at Queensland quarries and coal and mineral mines in accordance with the Coal Mining Safety and Health Regulation 2017 (Qld), AS/NZS 2985 and QGL02 Guideline for Management of Respirable Crystalline Silica in Queensland Mineral Mines and Quarries. For further information, visit the Simtars website.